A friend and her husband spent a weekend there celebrating a special anniversary. She said it was amazing because it seems like there's nothing between you and the sea. Wow. It is a beautiful picture. The picture looks hazy rather than being fuzzy. Maybe it is my old eyes. I would never have seen the sky diver. I wonder how they ever came up with that name They are not really diving into the sky or towards the sky, they are, rather, diving towards the ground but I guess "ground diving" doesn't have that heavenly ring to it. I hope you can take a look at my 1954 picture of a boat I took in Shipgama, Japan. Kodak color film had just come out and I didn't hink it would last. Go to http://www.oldmanlincoln.com/ and scroll down to the last picture. Angela, yes, I've had champers in that wonderful bar up there and it's true - ain't nuffin' between you and sea and the view. Abraham, yes, it was a hazy day that day - I'd assumed it was because I don't have a camera with an amazing zoom, as do you. So am very pleased you have commented. I'll try that short but from the other side of the hotel one day - ie from Menton direction. 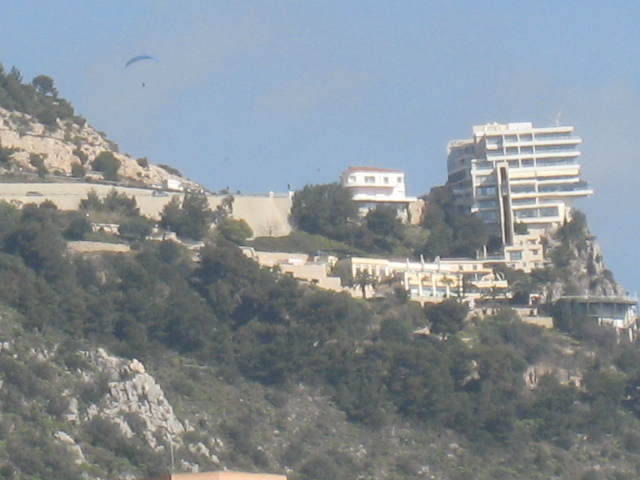 the hotel is much nearer to Monaco than Menton tho. That's a marvellous photo in Shiogama and what an interesting story that Kodak had just come out with colour film. Goodness, so much progress since those days but you know, I adore those old black and white photographs. It rather like listening to plays on the radio. You swear the heroine (or whoever) is wearing red, yet's it's radio. Imagination. That's what counts. Abe's right about "ground diving" not quite fitting!!! And...you don't need a flashy camera to tak great photos. Oh it seems to me that this Hotel is a little bit... bent!? So Jilly, since you've led such an amazing life, have you ever sky-dived? Dsole, it does look bent, doesn't it? Seems to be OK when viewed from the other side. Will take a pic from other side one day. It's all to do with the rock foundations, I suppose. And Isabella, no, I've never skydived but I'd love to have a go. Have you? And Mr. Richmond-upon-Thames Gentleman - who always makes laugh - thankyou for kind comment. It may not be sharp but it is a very detailed shot...well done!